February 4, 2016 - For the second time in less than a year, the U.S.-Ukraine Foundation, as part of its Health Care and Humanitarian Aid Program and its #SoundTheAlarmForUkraine Campaign, has organized the release of medical supplies and equipment to Ukraine. For this cargo shipment, the Foundation has coordinated the eventual delivery to Kharkiv with the NGO, the International Agency for Regional Development - GloBee, which is located in Kharkiv and is engaged in providing humanitarian aid to hospitals in the region. In seeking and obtaining humanitarian supplies here in the U.S., the Foundation primarily works with the Brother's Brother Foundation, a Pittsburgh-based international charity with warehouse facilities in Northern Virginia. Overseas shipping coordination is handled by the firm, Meest America Inc. The U.S.-Ukraine Foundation wishes to thank its many donors and volunteers who have generously contributed financial gifts or their time in making the Foundation's humanitarian aid work successful over the past 18 months. For more information regarding the #SoundTheAlarmforUkraine Campaign: CLICK HERE. For more information regarding Kharkiv and the Regional Development Initiative: CLICK HERE. To support USUF with a financial gift: CLICK HERE. To read Ukrinform's recent story regarding the Feb 4th shipment (in Ukrainian): CLICK HERE. 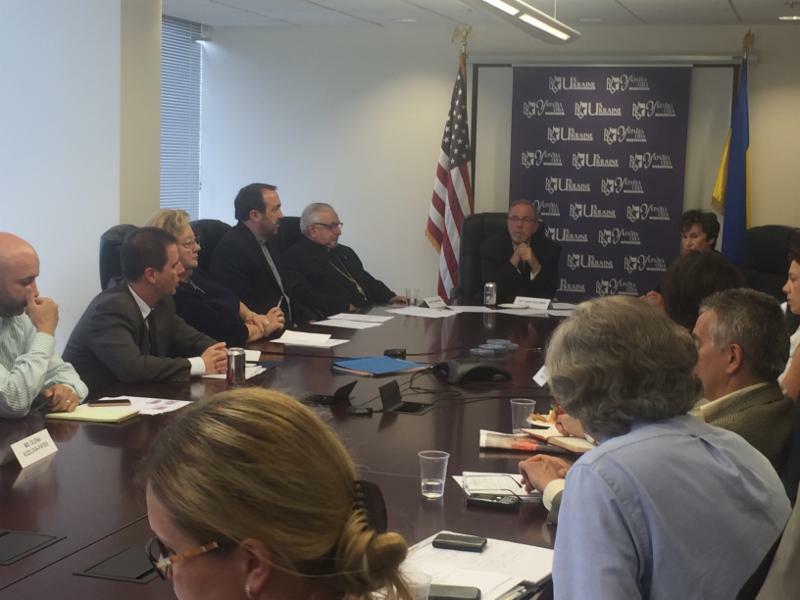 The U.S.-Ukraine Foundation collaborated with the Embassy of Ukraine in the United States of Americato host a roundtable discussion on June 1, 2015 on the Humanitarian Catastrophe in Ukraine. Representatives from such organizations as Save Ukraine Now, Wounded Warrior Ukraine, Ukrainian Federation of America, United Help Ukraine, Ukrainian Catholic National Shrine of the Holy Family,Ukrainian Catholic Archeparchy of Philadelphia, Embassy of Ukraine and USUF spoke about their organization's efforts to provide aid to the victims of the war. These organizations are helping to provide physical and mental rehabilitation for Ukrainians and their families impacted by the war, organizing donations of medical supplies, and putting together events to raise public awareness about the ongoing conflict. Before the roundtable discussion, USUF also hosted a Strategy Session led by President Nadia McConnell to discuss some of the major issues Ukraine is currently facing, as well as opportunities for cooperation and coordination of humanitarian assistance. One of the major issues discussed was the need for heightened international awareness. As Dr. Gary Kellner, founder of Save Ukraine Now, stated, "It was a crisis a year ago. 2 million people being moved from their homes is a catastrophe." And yet there is still not an appropriate amount of international attention on the need for humanitarian aid. Financial support, for both humanitarian needs and political reform, must be given to the Ukrainian government if the situation is to stabilize. Many at this strategy session felt that the lack of widespread international attention given to the crisis in Ukraine was a result of the Ukrainian government downplaying the crisis in order to not appear vulnerable. It was also mentioned that the restrictions of diplomacy, while a powerful influence on politicians, do not apply to NGOs, allowing them more flexibility in their methods for getting a message out. It was suggested that if NGOs and the government could work together more closely, they could send out a more clear and powerful message about the need for humanitarian aid in Ukraine. 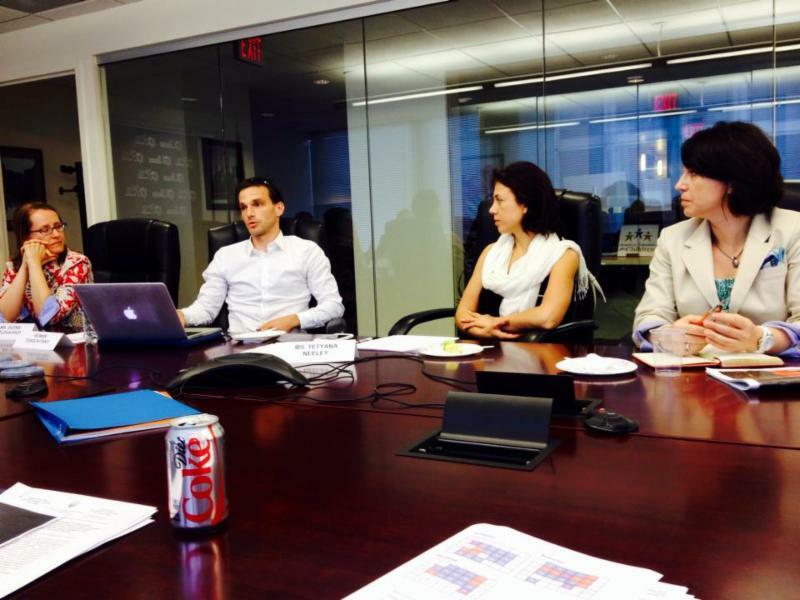 Yaroslav Brisiuck, Charges D'Affaires - Embassy of Ukraine in the U.S., Nadia K. McConnell, President - USUF, Fr. Wasyl Kharuk of the Ukrainian Catholic National Shrine of the Holy Family, and Auxiliary Bishop John Bura of the Ukrainian Catholic Archeparchy of Philadelphia (from left to right). Participants at this meeting also discussed the possibility of creating a database to keep track of humanitarian efforts in Ukraine. This would reduce duplicate efforts and make sure that donations and supplies go where they are most needed. This could also serve as a library for videos and articles related to Ukraine that could be used as a valuable resource for promo-ting awareness. After this strategy meeting, the organiza-tions were given the chance to present their experiences with humanitarian work in Ukraine. USUF's Humanitarian Aid Coordinator, Tetyana Neeley, described her success in donating 20 tons of medical supplies valued between $300,000-$400,000 to hospitals mainly located in central and eastern Ukraine where the need is greatest. She described the challenges and logistics of gathering donations, international shipping and delivery, and final distribution of supplies in Ukraine. Dr. Gary Kellner, founder of Save Ukraine Now , spoke about his organization's efforts to raise awareness of the humanitarian issues in Ukraine, especially by reaching out to religious communities. He discussed Detroit's city-wide initiative in which religious leaders of all denominations gathered to show and discuss their support for Ukraine, and how small steps like this can have a far reaching influence. (from left to right). Photo provided by Iryna Verity. Roman Torgovitsky and Olena Kozlova-Pates from Wounded Warrior Ukraine spoke about how their organization works to create modern psychological and physical rehabilitation services in Ukraine. They provide training organized in four sessions where trainees learn basic understanding of trauma, rebuilding resourcefulness, restoring emotional stability, psychological techniques to overcome trauma, and methods for post-traumatic physical and psychological re-orientation for the future. Dr. Zenia Chernyk, President of the Ukrainian Federation of America, discussed her organization's many efforts in Ukraine such as their involvement in providing rehabilitation for soldiers and their families and helping to set up a first response program similar to 911. The event concluded with a blessing from Auxiliary Bishop John Bura of the Ukrainian Catholic Arche-parchy of Philadelphia. Note: If your organization is involved with humanitarian aid to Ukraine and would like to participate in future meetings or communications, please contact the Foundation. Washington, DC, April 29, 2015 – The U.S.-Ukraine Foundation's Humanitarian Aid Program achieved a major accomplishment today when a 40 foot tractor-trailer with a load of medical supplies weighing 20 tons and valued between $300,000 - $400,000, left for Ukraine from the Fairfax County regional office of the Brother's Brother Foundation. The humanitarian assistance effort for Ukraine is a collaborative one that includes a number of organizations and many individuals. A portion of this joint work occurred in Pittsburgh, where members of the Ukrainian-American community partnered with the Brother’s Brother Foundation (BBF) in donating part of the total aid sent to Ukraine. Led by Dr. Alexander Kirichenko, a radiation oncologist at Allegheny General Hospital in Pittsburgh who came to the U.S. in 1997 from Ukraine, the coordinated endeavor of donations came from the Allegheny Health Network, Butler Health System, Trinity Health System in Steubenville, Ohio and St. Mary’s Ukrainian Orthodox Church in McKees Rocks, PA.
John A, Kun, USUF's chief operating officer, noted, “Tetyana performed wonderfully in a complex environment. She worked with our good friends in Pittsburgh, with BBF both in Pittsburgh and in Fairfax County, with our shipping firm, Meest, and with our many volunteers and cooperating organizations, such as United Help Ukraine. To participate in this humanitarian effort, contact the U.S.-Ukraine Foundation or donate at http://usukraine.org/donate.shtml. Father Timothy Tomson (center), with St. Mary Ukranian Orthodox Church, blesses a shipment of medical supplies bound for Ukraine Thursday, April 16, 2015. The shipment, which will be joined by another load from Washington D.C., will end up being used in several regional hospitals. Also attending the blessing are Richard Goddard (from left) and Luke Hingson from Brother's Brother and Dr. Alexander V. Kirichenko. has now reached the $200,000 level in assistance! Supported by volunteers on the ground both in the U.S. and in Ukraine, USUF's humanitarian assistance has been delivered securely and to those in need. Recent statistics released by the United Nations Office for Coordination of Humanitarian Affairs are grim. More than 5,000,000 people require some form of humanitarian assistance including 1,700,000 million children. It is estimated there are over 1,000,000 Internally Displaced People in Ukraine. Since mid-April 2014, over 6,000 people have been killed and 15,345 wounded. USUF plans to send more medical supplies and equipment to Ukrainian hospitals in 2015. If your community hospital can help donate, please be in contact with USUF. Your volunteerism will be greatly appreciated. 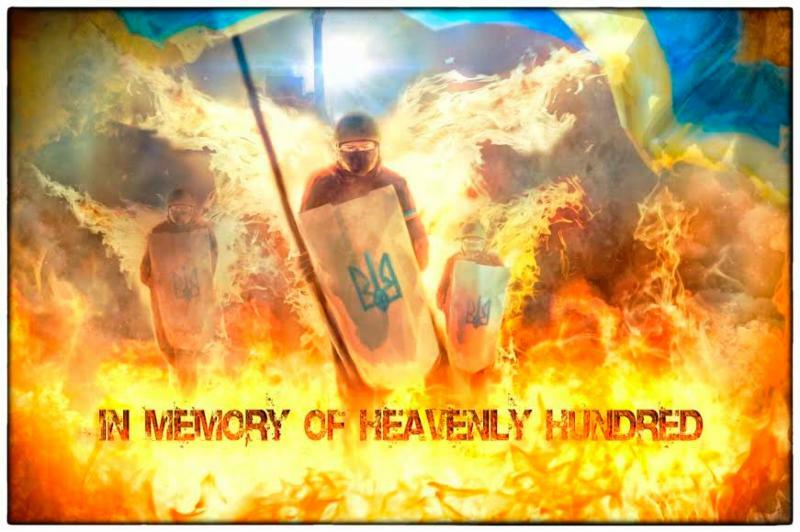 February 20, 2015 - United Help Ukraine, in cooperation with the Embassy of Ukraine in the USA and in partnership with the U.S.-Ukraine Foundation, Commemorated the Fallen Heroes of Heavenly Hundred, those who stood on the Maidan for human dignity, justice and freedom in Ukraine. This special evening was marked at the Embassy of Ukraine in Washington, DC. All proceeds were dedicated to humanitarian aid for Ukraine. December 16, 2014 - In cooperation with the Brother's Brother Foundation, the U.S.-Ukraine Foundation continues to send medical supplies to Ukraine for those impacted by the war. The Foundation's efforts are being coordinated by Tetyana Neeley. During the past weekend she was assisted by area volunteers Natalia Moubray and Yelena Lev Key. The overall assistance being provided by the Foundation is a considerable one, which includes the cooperation and volunteerism of other organizations, such as Ukraine Abroad, Ukrainian Freedom Fund and Goals for Ukraine (on Facebook at https://www.facebook.com/GoalsForUkraine) and other individuals such as Pavel Yarmolenko, Matthew Kostman and Brian Allen. Thank you for the service of our volunteers and cooperating organizations! And, our efforts are being aided by YOUR GIFTS to the Foundation! Thank you - one and all - for your generosity in giving and serving! September 30, 2014 - Ms. Tetyana Neeley joins the U.S.-Ukraine Foundation to become the Humanitarian Aid Project Coordinator. 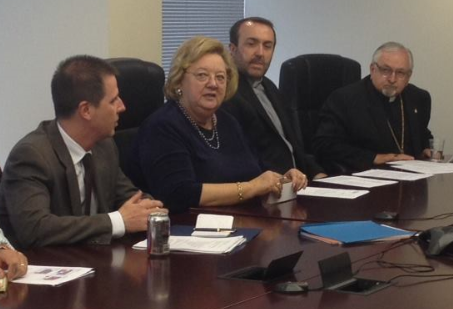 In this capacity she will oversee new efforts to effect humanitarian support for Ukraine through the Foundation. Before coming to the United States, Tetyana earned a masters degree in engineering from Kyiv National University of Construction and Architecture. She also holds a certificate in office management from Kyiv Polytechnical Institute. Ms. Neely is also an Independent Payment Processing Consultant and the founder and principal of NoVa PayPros, a credit card processing services company serving the Washington, DC metropolitan area. You may remember that in 2008, Western Ukraine was ravaged by floods. At that time, the Ukraine Disaster Assistance Fund was created by a coalition of organizations, including the U.S.-Ukraine Foundation, Ukrainian Federation of America, Ukrainian American Coordinating Council (UACC), and U.S.-Ukraine Business Council to provide some form of assistance to this affected area. In 2008 and 2009, nearly $40,000 was raised. During 2010, the coalition decided to aid a community that was particularly hard hit by the floods, and that village was Holovetsko. What was needed was a large bus, to service the Holovetsko village school, as well as eight nearby villages in the Stariy Sambir District: Ripiano, Dnistryk, Smerichka, Babyno, Hrozovo, Vytsiv, Mshanets, and Hvozdets. Representatives of the coalition worked directly with Ivan Haiduk, principal of the Holovestko school, regarding the purchase of the bus, which would be approved by the Ministry of Education. The bus was purchased and it now serves over 200 students. While the bus is officially owned by the Department of Education of the Executive Council of the Stariy Sambir District, Lviv Oblast, the Holovetsko School is in charge of the use of the bus to meet the needs of their students. The local Department of Education will provide financing for the bus maintenance, gasoline and the bus driver who will be on their payroll. And there is more good news . . . not all the Disaster Assistance Funds have been spent. Funds remaining are to go for other Holovetsko village school needs, either for equipment, facility improvement, etc. In addition to the Disaster Assistance Funds, the U.S.-Ukraine Business Council directly donated $3,000 to the school for the purchase of school furniture. Finally, we wish to thank the Polish-Ukrainian Cooperation Foundation (PAUCI) for their on-the-ground assistance in handling the bus purchase. "The Ukraine Health Care Project, started with only hope, a vision and no funds. I am proud to say that over the past five years the Foundation has provided over $53,000 in health care and humanitarian assistance to Ukraine." In September 2002, the U.S.-Ukraine Foundation received a gift of $1,000 from the Willaim T. Kemper Foundation of Kansas City, MO to assist with the expenses associated with the operation of a soup kitchen in Kharkiv, Ukraine. The Foundation is grateful to the William T. Kemper Foundation for this generous help. 400 HIV rapid testing kits were donated to the Embassy of Ukraine for the Ukrainian military. Ukraine's rate of HIV infection doubled between 1999 & 2000. While originally limited to high risk areas, such as ports on the Black Sea, cases are now reported in all 25 Ukrainian oblasts and estimates range as high as 1% of the population. The donation of the kits were provided by Expanding Abroad, Inc. In July 2002, USUF sponsored Julian Kiyak's paper "Myocardial Hibernation as a Cause of Heart Failure in Acute Myocardian Infarction." This paper was selected for publication in the proceedings of the 8th World Congress on Heart Failure. In July 2001, USUF also gave $1,000 to assist Dr. Kyak to attend the 2nd International Congress on Heart Disease in Washington, DC. With over $5,000 in funding from the U.S.-Ukraine Foundation, the Street Children Project of the Ternopil Charitable Foundation (Caritas) provided material and social support, health treatment services, and cultural enrichment programs to the poor children of Ternopil and the raions of Ternopil, Zbarazh, and Terebovlya in late 2001. The coal mining disaster that occurred on March 11, 2000 in the city of Krasnodon in eastern Ukraine tragically took the lives of more than 80 miners. The accident left over 125 children, of whom 71 are under the age of 15, fatherless. Upon hearing of the disaster, the Foundation initiated a national campaign to collect funds which could be passed on through contacts established by USUF’s Krasnodon-Birmingham CPP partnership. In total, the Foundation's total direct financial aid exceeded $13,000. To contribute to the creation of a Ukrainian Alliance for the Prevention of Birth Defects. USUF supports "Ukrainian Central Caritas"
Altogether, between December 1997 and 1999, USUF delivered over $32,000 to Caritas to finance three projects in western Ukraine: equipment for a soup kitchen in Sosnivka, medical equipment for a children's rehabilitation center in Chortkiv, and sewing courses in Drohobych. In November 1999, the U.S.-Ukraine Foundation made a charitable contribution to the Cardio Foundation in Lviv for the purpose of assisting in the development of cardiac surgery.